I am still having fun with the picot lock join and Martha's tat days patterns, they have become especially useful for Easter. 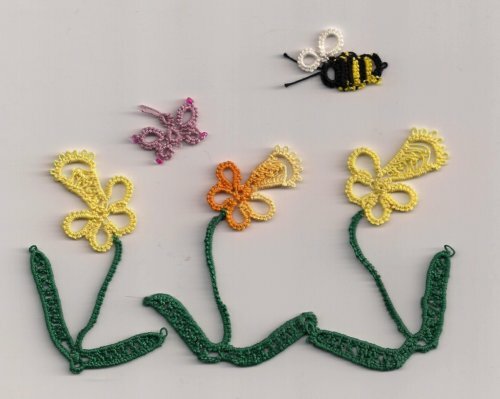 I made some daffodils for more cards but as you can see have put them together with Jane's SCMR butterfly and Martha's bumble bee (from her book 'New Critters on the Block') i.e. block tatting. So there are quite a few techniques in this picture. Of course I need to show you some real daffodils blowing in the cold wind, still no sign of Spring. 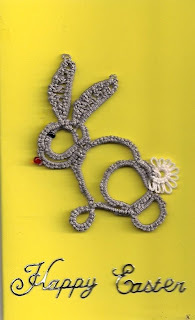 Last year, just before Easter Sunday, I managed to design an Easter egg by tatting around a button (the link to the pattern is on the right hand side of this blog). Jane showed her design yesterday and that made me wonder if perhaps mine would work around a central piece or 'doodad'. This is how it came out. I had to add an extra ring at the bottom to make it fit but it turned out rather well. The doodad is 'vintage' as I purchased quite a few of them 36 years ago when I lived in Hong Kong. I think this is the best use I have found for it since then! And here is Jane's Easter Egg, which I test tatted for her, not a very good example, but it was my first try! Yesterday I found a branch had come off a tree in one of the churchyards so in freezing temperatures and with a cruel wind blowing, tore off the small bits and dragged the remainder of the branch to the car. 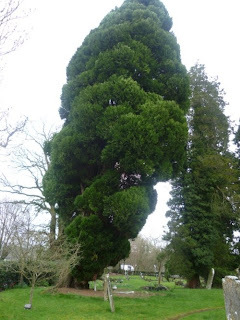 The trouble is we don't know what tree it is, I think it is a Cypress, anyway the wood is very interesting inside. Actually I am supposed to be on the look out for either yew or cedar! Last week after working in a wood behind another of the churches I came back with holly. Here it is being cut down, we tried to burn it but it was too damp. Anyway I rescued a couple of thick branches to make some Christmas shuttles in the future, at the moment the wood is very damp so is going to take at least a year to dry out. I'm talking about what Jane and I get up to! Well nothing much really except of course we e.mail each other a great deal as we don't live very close, occasionally I visit her but at other times 'Im in the garage tends to make the journey more often as he visits his mother who lives in the same town. As today is Mothering Sunday here in the UK and I do mean Mothering Sunday, not 'Mother's Day', that is where he is at the moment. However, he did take with him the latest batch of shuttles and hooks for Jane to sell in her Etsy Shop. I have on good authority that the aforementioned will be going 'live' on Thursday night (UK time) but Jane will tell you more about that tomorrow on her blog. Meanwhile I have been 'home alone' as my two sons are too far away to visit. Jane and I inevitably talk about tatting and designs over the internet, mind you that is rather one sided because Jane, as you know, seems to create patterns in her sleep! Whereas my tatting creations are planned in my head but rarely get further than that. However, sometimes I manage to make those ideas become reality, but patience is often lacking, along with of course time. 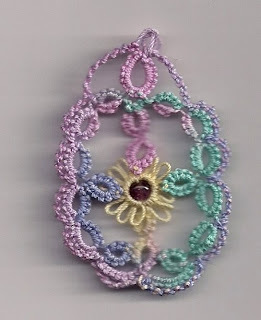 If I manage to progress with a piece of tatting that I am designing I obviously scan it and send it to Jane for comments, in fact she frequently does the same when she is designing something. We are completely honest with each other and at times that is very hard when you don't want to say negative things. So here I am, or rather my neck! Wearing my latest design. I love necklaces, well in fact all jewelry, but very aware that tatting needs to be quite firm if it is to be worn around the neck, otherwise it tends to curl. 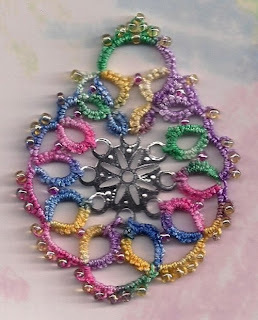 With this design I put beads in the first row and then added some chains which naturally makes the tatting curve but perhaps more importantly gives it that firmness which is very necessary. I suspect someone else has probably done something similar so really can't claim it as my own, nevertheless I wanted to share it with you. Rosemary is for remembrance, especially for those who have died. 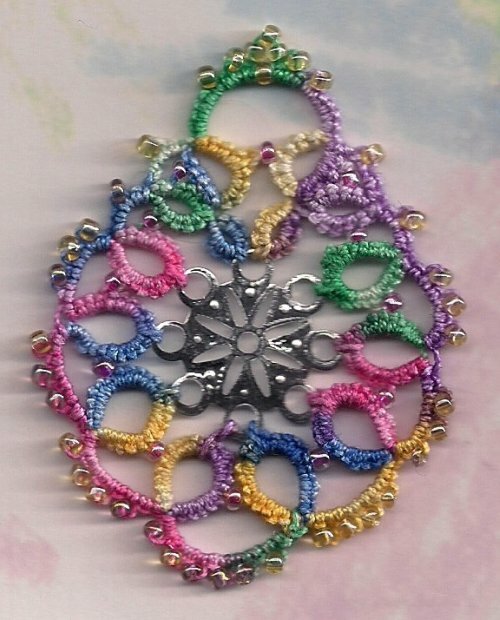 The next necklace I plan to make will be using one of Jess's threads, can't wait to see how that looks! Yes well it is obvious we don't keep the car in our garage! It is, as most of you know, used as a carpentry workshop. The next batch of shuttles are now being packaged and will be winging their way to Jane's very soon. But first I wanted to let you know that there are a few slight changes. The first you may have guessed by looking at these two shuttles, the photograph rather gives it away. Can you see the difference? The second is, instead of the hooks having 'wooden hats' they have plastic caps. I have to say these plastic caps are very strong and certainly not flimsy so should last a long time and what is more they fit very neatly onto the hook. One of the interesting facts about the latest batch of pop-a-bobbin shuttles is that the 'pushers' - as we call them are all (with the exception of two) made from the oak that orginally came from the underneath the altar at one of our churches. The wood was then made into the font you will see in this post. So it is extremely old wood and rather holy! When I took this photograph I had no knowledge of this fact, so pleased I did as by the time I was told they were being dispersed into packets! There are various woods in the latest batch of pop-a-bobbin shuttles to choose from, but there are no hook less ones. We ordered 40 dozen hooks from Japan, they have arrived in England, but before we receive them we have to pay £130 to release them due to customs and excise duty and also Import VAT, this was a nasty shock but we have no other choice when it comes to getting a regular supply and the quality of these hooks has been much better than the ones we previously purchased in the UK. I will let you know nearer the time when the shuttles and hooks will be going into Jane's shop.